Smoke Tree Ranch in Palm Springs, CA. Welcome to Smoke Tree Ranch real estate in Palm Springs, California. This guard-gated exclusive community is uniquely different from all other Palm Springs neighborhoods. It is defined by its natural, pristine setting, and homes of remarkable style and rustic character. Privacy is paramount in this ‘Crown Jewel’ of Palm Springs. Smoke Tree Ranch is considered by many to be the ultimate example of exclusivity, notoriety and prestige. This Palm Springs neighborhood exudes the desert’s relaxed, casual, and rustic lifestyle, with its roots dating back to 1936. It is so private, tucked away from view, that many Palm Springs residents have never ventured behind its guarded entrance gate. Approximately 300 acres of the ranch are dedicated to the Smoke Tree Ranch, with its amazing array of luxury residences with the 20 acre Smoke Tree Guest Ranch at its center. The entry road to the ranch is lined with Smoke Trees. 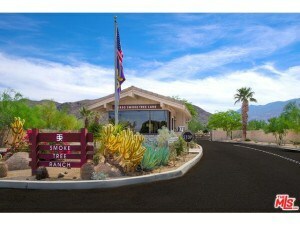 Their unique foliage and springtime flowers, create the image of smoke; hence the name Smoke Tree Ranch. This neighborhood offers an unmatched lifestyle enjoyed by many celebrities of the past, including Walt Disney. Smoke Tree is a very special place where families have gathered for nearly 100 years. This historic and pristine neighborhood is conveniently located ten minutes away from downtown Palm Springs and its amenities. Fine dining, live entertainment, boutique shopping, art galleries & the Palm Springs Museum. The Palm Springs International Airport and Interstate 10 are an easy 20 minutes from Smoke Tree, making travel outside of the desert easy and accessible. Today, there are 93 homes in Smoke Tree, represented by a variety of architectural styles. Resale homes in Smoke Tree Ranch rarely come on the market and new homes are under construction. Owning in Smoke Tree Ranch gives you the opportunity to join the Ranch Club, which offers an incredible lifestyle. There is a recently renovated clubhouse, restaurant, swimming pool, tennis club and on-site hotel/bungalows for visiting guests. Access to Smoke Tree Stables is for Owners only. As an owner, you also receive 660 shares of Smoke Tree ranch stock. Again, families including the Walt Disneys, have made Smoke Tree Ranch their desert home or retreat for over 100 years. People who like Smoke Tree Ranch also tend to enjoy Griffin Ranch, The Mesa, La Quinta Polo Estates and Deepwell Estates.